It's a good idea to start some of your garden seeds indoors about this time of year so you'll have plants ready for your garden in the spring. If you don't have a greenhouse available, just keep them in the house near a window. 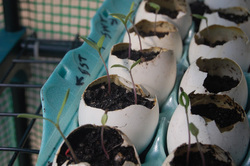 You can spend lots of money on seed starter pots at a home supply and garden store, but if you eat eggs, why not try this little trick? Start saving your egg shells. (Of course, you'll need to have started this process long before March!) It's not difficult to crack an egg towards the small end of the shell leaving you with the majority of the shell as a starter pot! Save the shells in an empty egg carton throughout the year so they're ready when you need them. to drain through the shells. Next, fill each shell with potting soil, plant the seed, label and water. Be sure to put egg cartons in a water tight container to prevent dripping water all over. In a week or two, you will see plants starting to come up . . . and your garden has been started. Once the last freeze has passed, simply crack the egg shell by squeezing it before you transplant into your garden. This will allow the roots to spread beyond the shell as it grows, but you won't disturb the root system when you plant it into your garden! Shelter. It’s easier for butterflies to fly and feed in a calm area, so provide shelter from wind and rain. Water. Butterflies cannot drink from open water, so wet sand, earth, or mud are the best water sources. Sink a pail into the ground, fill it with mud, and place a few sticks on top for the butterflies to perch on. blood flower, elm, fennel, milkweed, passionflower, senna, and wild cherry. yellow, orange, red, and purple. The best nectar plants include azaleas, butterfly bushes, Mexican sunflowers, New England asters, verbena, and yellow cosmos. Some butterfly species will accept rotting fruit, sugar or honey water. Butterflies need flowers that provide a platform to perch on while they probe for nectar with their proboscis. It’s easier for them to probe simple flowers, so it’s best to avoid double flowers. Butterflies are generally around from spring into fall in most parts of the country, so you should plant flowers for a succession of blooms throughout the growing season. Start leek seeds indoors 12 weeks before the last frost. When it’s time to plant the seedlings, dig a trench 1 foot deep and 1 foot wide. Fill the bottom with a 5-inch layer of compost and transplant seedlings into holes 6 inches apart. As they grow, gradually fill in the trench with more soil, keeping the tips of the plants exposed. To increase your supply of dahlias, plant each tuber indoors in a pot in March and take cuttings in April to set out as plants after the danger of frost has passed. When starting coleus, impatiens, petunia, primula (primrose), or snapdragon seeds, make an indention in the potting soil and sow thinly, but don’t cover the seeds with soil. They need light to germinate. When starting cucumber seeds indoors, place the pots in a tray and put the tray on top of the refrigerator. The seeds will sprout faster with the heat given off by the fridge. But once they sprout, move them into bright light. These bulbs make great additions to your landscape. With over 500 daylily varieties to choose from, you’re sure to find just the right colors and shapes you’re looking for. Daylilies bloom from early spring until late fall, and they’ll grow in almost any soil. A big plus is that they are seldom bothered by bugs or diseases. Mixed perennial flower border: allow a 16 to 18 – inch circle for each daylily if you’re going to divide and replant it in a few years. Allow a 24 to 30 – inch circle if you plan on leaving the clump intact. between each cluster or group of daylilies. Edging along a walk: Space the plants 12 to 18 inches apart in a single row. This is the time of year to enjoy the fruits of your summer labor. Nothing is better than opening a jar of Basil Pesto that you froze last summer. Spread it on French bread and broil for a few minutes or mix a few tablespoons into fresh pasta. The whole house smells like summer for a little while. Another favorite of mine is to open a jar of rose petal jelly on the snowiest day of winter and spread it on warm toast. Heavenly! Now is the time to really think about where you find your Bliss. Is it in the herb garden? Rose Garden? By the sweet pea bed? Having Lilies that are so fragrant they make the entire yard smell like heaven? Whatever you really dream of having now is the time to start planning how to include it into your garden. ordering it all – make a couple of small orders to make sure you have what you really want. I’m off to do just that! Since you’ll be living with perennials for many years to come, you’ll never regret choosing them wisely from the start. Follow these guidelines for perennial pleasure! Match sunlight requirements of the perennials to your planting locations. Create beds of complementary colors like blues and oranges, reds and greens, or purples and yellows. Vary plant heights to add interest to your landscape. A perennial border needs careful watching, especially if grass grows right up to its edge. In that instance, the front-row plants may flop over and make it hard to mow the lawn. So make your landscape chores a whole lot easier by arranging your perennial beds so that they border a brick, gravel, concrete, or flagstone walk. This will keep the edge nice and neat, which means less work for you! Start thinking now about what you want from your herb garden next summer.Make a list of seeds and plants you will need and start checking them off. Are you dreaming of a lovely sachet to make your linens smell good?Plant lavender. How about a Bouquet garni to drop into a great pot of soup or stew?Choose thyme, sage,parsley, bay, tarragon and rosemary. If salads or cakes topped with edible flowers are in your summer plans think of nasturtiums, chives, borage, or violets. Herbal teas add a nice touch to an afternoon break. Mint, either steeped on its own or added to a glass of regular iced tea, is refreshing.Chamomile, roses, sage, lemon grass, or lemon balm are also good choices. Candied blossoms are beautiful as garnishes for desserts or can be eaten as candy.Geranium, borage, roses, violets are nice for this.Angelica or Lovage stems can be used as a fruitcake ingredient or garnish when candied. border for easy access.Nasturtium leaves are great chopped into a salad and the blossoms are lovely on either a salad or cake.Thyme, parsley, chives, and oregano are all nice in a flower bed by the kitchen door or in a window box. Think of all the possibilities at your fingertips with just a little planning! During the summer of 2009, we conducted a soil survey for stubby-root nematodes, Paratrichodorus and Trichodorusspp., throughout Alaska. The objective of the survey was to sample soil from peony and potato fields in Alaska and have the samples screened for any nematodes present. Ordinarily, these stubby-root nematodes are not found in Alaskan soils, but historical accounts of surveys conducted in Alaskareported a few sites with Trichodorus and Paratrichodorusspecies. Why is this important and should we be concerned? Relatively recently, a niche market industry in cut flowers, particularly peony, has been developing in Alaska. plants have recently been planted throughout Alaskain an attempt to meet that market demand. In some plantings, symptoms of Peony Mosaic Virus (also known as Tobacco Rattle Virus) have been showing up in Alaskan peon plants. The virus is vectored from one plant to another by several species soil nematodes of the genus Trichodorusor Paratrichodorus, mainly Trichodorus allius. Alaska has low numbers of nematodes in the soil, and plant pathologists have assumed that the peony roots have arrived in Alaska already infected with the virus and that the nematode vectors aren¹t present in Alaskan soils to spread the virus. However, the question remains as to whether the nematode vectors are already in Alaskan soils, or whether they could survive if they should arrive on peony roots. In an attempt to answer some of these questions, soil samples were collected during July through September. A total of 25 soil samples were collected in the Matanuska Valley,Anchorage, Kenai Peninsula, Fairbanks, Delta, and Nenana areas. All samples were sent to the Plant Parasitic Nematode Lab at Oregon StateUniversity for analysis and tested negative for Trichodorus and Paratrichodorus species of nematode. However, the lesion and pin nematodes, Pratylenchusspp. and Paratylenchus spp. respectively, were detected along with a few non- plant parasitic nematodes. The pin and lesion nematodes are not known to vector the virus. In 2010, we plan to continue soil sampling around peony plants and in fields where Trichodorus or Paratri-chodorus may have been introduced. Until we know more about the distribution and survival of plant para-sitic nematodes in Alaskan soils, anyone bringing peony rootstock (or any other balled and burlapped or potted plants containing soil) should ensure that the plants are from fields free of peony mosaic virus or that the rootstocks are heat treated to kill any associated nematodes.